It never fails. Come spring, my mailbox is filled with homeschool catalogs from companies all hoping I will plunk down money to purchase this year's MUST HAVES in education. While I enjoy perusing the glossy pages of my favorite vendors as much as the next homeschool mom, my wallet just won't allow me to purchase all the items on my wish list. But the truth of the matter is, with a little creativity, a library card, and a quick search through my cupboards, I can find all I need to provide a wonderfully enriching education for my children WITHOUT spending a dime. Purchased at the dollar store, the number magnets lining my fridge get lots of use throughout the week. My preschooler doesn't need to know how to write to be able to order numbers or create a two-digit number that I call out for him. 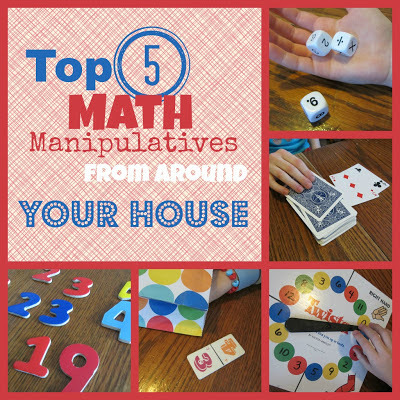 My older children can use magnets to create 3-dimensional math facts or multi-digit numbers. A gift bag and a stack of dominoes is all I need for a quick review of addition or multiplication facts. I toss all the dominoes in the bag, have my child draw out just one, and instruct him/her to add or multiply the two numbers together. This continues until all the dominoes have been removed from the bag. Although ANY dominoes will do, we typically use a set that have arabic numerals on them instead of dots. Before I toss out a board game that is missing most of its pieces, I strip it for parts. A few months ago, after our Twister mat earned a place in the waste basket, I used a permanent marker to write numbers on each of the colored circles of the spinner. Now, whenever I need a fast review of math facts, I pull out the spinner, call out a math process AND one number, and allow my budding mathematician to spin. He/she adds (or subtracts, multiplies, divides) the number spun by the number I originally called out and is awarded a few minutes of review WITHOUT flashcards or a boring worksheet. We've been using game dice for math process review for quite some time. But, after I found a set of math process dice at our statewide homeschool convention a couple of years ago, I have been pulling out the dice a lot more often. In addition to having ARABIC numbers instead of dots, this specialty math set also came with two process symbol dice. Like playing cards, dice offer an endless amount of review game options. Here are just a few resources packed with ideas. 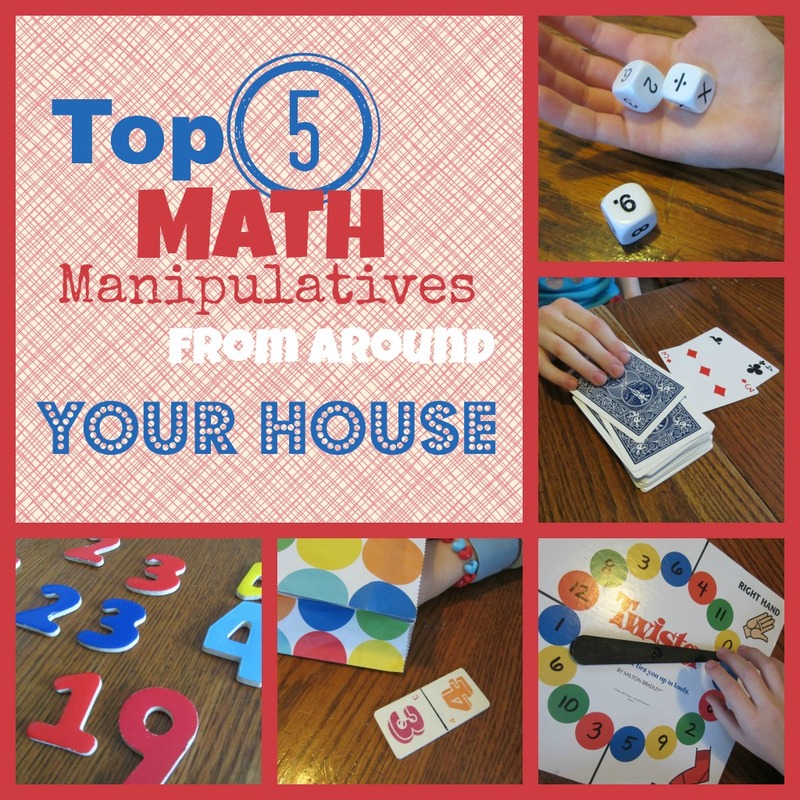 What is your favorite math manipulative from around your house? Thanks for the great ideas. I use mini erasers with my kindergartner for counting, graphing, patterns, addition, subtraction, bingo markers, etc! Legos are great too! Our most used math manipulative are clear counters. I would have never guessed how much we were going to use them when I ordered them online this last summer, but we pull them at least 2 or 3 times a week if not daily. I think we have used them with every subject this year. Since they are clear great for marking things you still want to be able to see. It is true that all the students looking for a higher education are under terrible pressure. They have to select the appropriate career option well in advance so that they get proper training and are well prepared.